UPDATE (Feb. 12): The bald eagle eggs have hatched; you can watch the chicks' parents caring for them below. Previously (Feb. 8): Right now, it's good to be an eagle. And we are not just talking about football. Bald eagles are thriving. The U.S. national emblem is no longer listed as a "sensitive species" in Washington state, and its population count is booming in Kentucky and Illinois. The same is true here in Southern California. 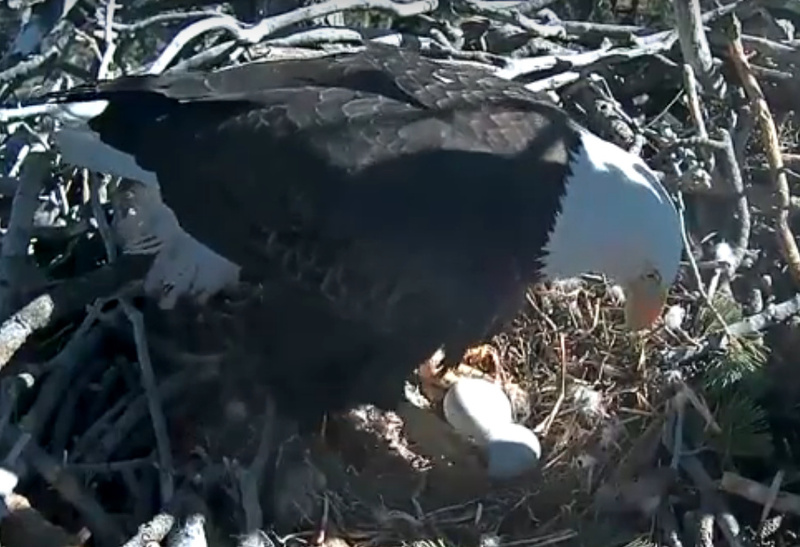 Locals are on bald eagle birth watch because a pair of eggs are set to hatch this week in the forest near Big Bear Lake. The Friends of Big Bear Valley have set up a Nest Cam so that anyone can track the eggs' progress. Eagles have not always thrived in the Big Bear area. Before 2012, they were only seen during the winter, while they visited to find food. But that year witnessed the first successful eagle nesting close to Big Bear Lake. We actually believe that the female who's on the nest - Jackie, we call her - was the first chick that was hatched in that nest, in 2012. She was the first eagle hatched in the San Bernardino Mountains. She was a groundbreaker for us. Once the eggs hatch, Eliason expects that Jackie and her partner, nicknamed Mr. B, will devote themselves to providing for their young by catching fish and ducks from Big Bear Lake and bringing them back to the nest. Eliason says the chicks will grow remarkably quickly. In about two-and-a-half to three months, they'll be the same size as their parents, and ready to leave the nest. And then, after that, they'll stay close to their parents for another few months while their parents help them with hunting and feeding. This Saturday, the U.S. Forest Service will host a monthly eagle counting program, though Eliason says that the chicks will be too small and too far away from the counting sites to be seen with the naked eye. A spotting scope will be set up for those interested, but Eliason says that the Nest Cam will be the best way to see the chicks. Delta tunnels get scaled back, you can now shop from your car, is Sacramento the new Hollywood? What's next for Democrats hoping to find a fix for DACA recipients?